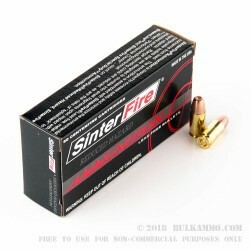 This 9mm cartridge by SinterFire features a 90 grain frangible bullet. 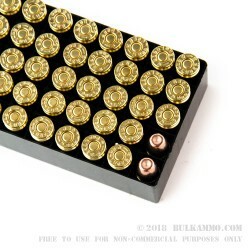 That is a fairly light weight for a 9mm bullet, but it conveys a low recoil and fast 1,350 fps muzzle velocity that you’re certain to enjoy at the range. This bullet’s primary feature is its frangibility. 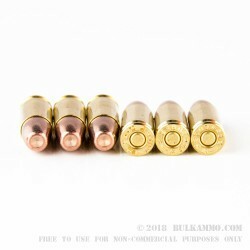 Because it is made of compressed tin and copper powders, this bullet disintegrates on impact, effectively eliminating the threat of ricochets. Additionally, this bullet is essentially incapable of penetrating a wall, meaning it’s a relatively safe bet for home defense where you recognize the absolute necessity of bystander safety. Whether you would opt for this cartridge for training with steel targets or for personal defense, it’s backed up by SinterFire’s reputation as the industry leader for lead-free projectiles. The Pennsylvanian company has innovated frangible bullet technology since their foundation in 1998, and their ammunition is favored by law enforcement experts for use in training programs. Q: Are the projectiles in these rounds completely lead free? A: Hello Ben, This ammunition does use a lead-free projectile but does not use a lead-free primer. You will want to use the SinterFire Greenline for a completely lead-free round.